So in the mountain bike world, timed races are popular. Six hours, eight hours, twelve hours, whatever. Same goes in the ultra running world. 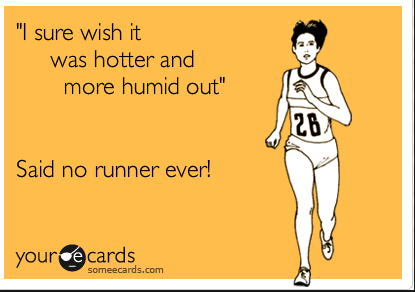 There have been plenty this summer in Georgia – Hot to Trot, Merrils Mile etc. I missed both due to TransRockies trainging and them just not fitting in the plan. The deal with these are that you run a loop – usually about a mile – as many times as you can in the prescribed period of time. So really more of a mental challenge than anything else as you’ll be going round and round and round the same piece of dirt for hours. 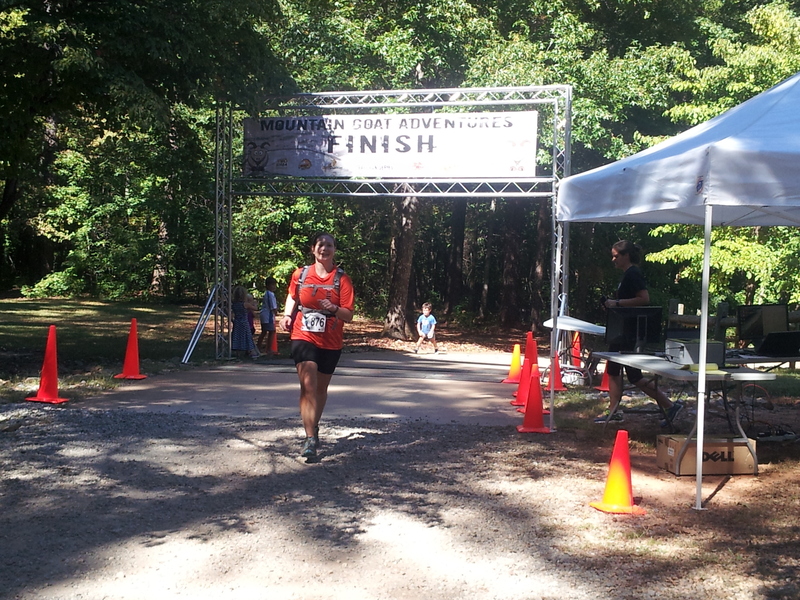 Anyways, Mountain Goat Adventures decided to put on 6 Hours of Dauset Trails this year as an inaugural event. In talking with my friend Elizabeth (she has a blog too – go read it!) this summer, who was training for the event as her first foray into the ultra or endurance running world, I was intrigued. It was set up a bit differently. It was almost a 6 mile loop that was run as many times as possible in 6 hours. 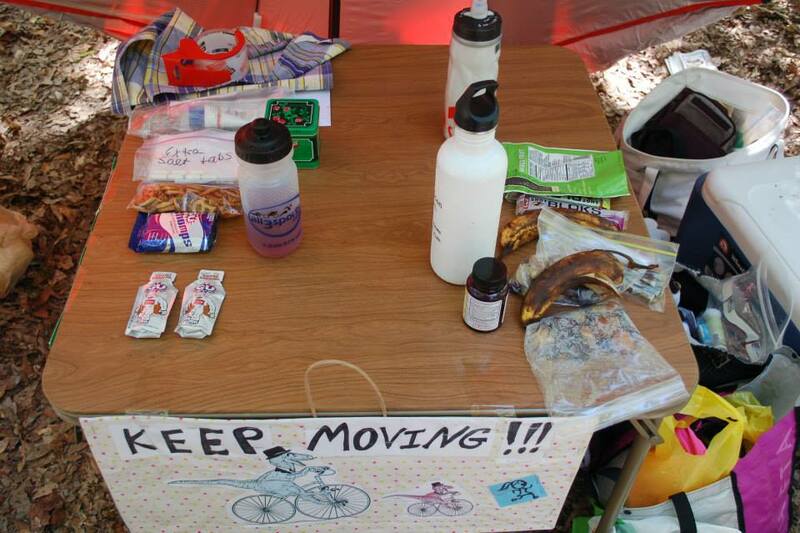 What sold me on the whole thing is that you could set up your own little “pit” stop at the start/finish area complete with your own supplies and snacks. I don’t know why but I loved that idea…that and they were offering a free Mountain Goat Adventures mesh tote bag for the first so many to sign up… so a few weeks before the TransRockies, I decided to sign up. When I got done with the TransRockies, immediately upon getting back, I was already spazzing about what was next. Honestly I really really wanted to tackle a 50 miler, feeling that I had the mileage I needed in after training for and running the TransRockies and thinking that any course I picked out here would pale in comparison to what I had run in the Rockies. 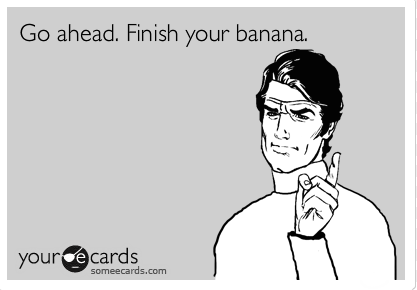 Luckily I had this race on the schedule already to kind of quell my looming insanity and give me something to focus on. I trained a little with a really chill week following the TransRockies, and a twenty miler the next weekend, and then a down week, then it was race time again already! Yay! Figuring after this race I had some time off again, I signed up for a ten day yoga detox at the Kashi Ashram. It was a cool thing they did seasonally where you do a lot of yoga and eat super duper clean for ten days – to kind of reset. And after the eating debacle that was the TransRockies and beyond…um, I needed it. However, Day 1 fell on race day. Hmmmm…this was going to be interesting. I decided I’d follow as closely as I could and actually did great considering. Yeah this is definitely how it went down at the TransRockies. Six days of running and eating to excess. The night before I finished my pre-detox meeting at about 8. Pooky & I proceeded to our favorite pizza dive Camelis and feasted like it was going out of style. Monster slices and French fries all around. We went home, and I packed up for the race brining coconut water, some plan potatoes, and bananas. I brought some Huma gels and nuun too but didn’t really use too much. Oh and salt pills. Thank god for salt pills. I was tasked with bringing a card table and chairs for Elizabeth and I to set our stuff up on. However, I didn’t go to the storage unit to get said table and chairs until the night before the race at about 9:30pm. I come to find its missing. Hmmm. Where did it possibly go? The mystery remains unsolved so if you find my black card table, please let me know. I felt so bad and quickly sent Elizabeth a message and luckily she had one to bring. Sigh. Crisis averted. The next day I made myself some oatmeal and fruit and decided to wear this super cute pink tie dye tank top that my cousin had just happened to mail me the day before. Awesomeness. 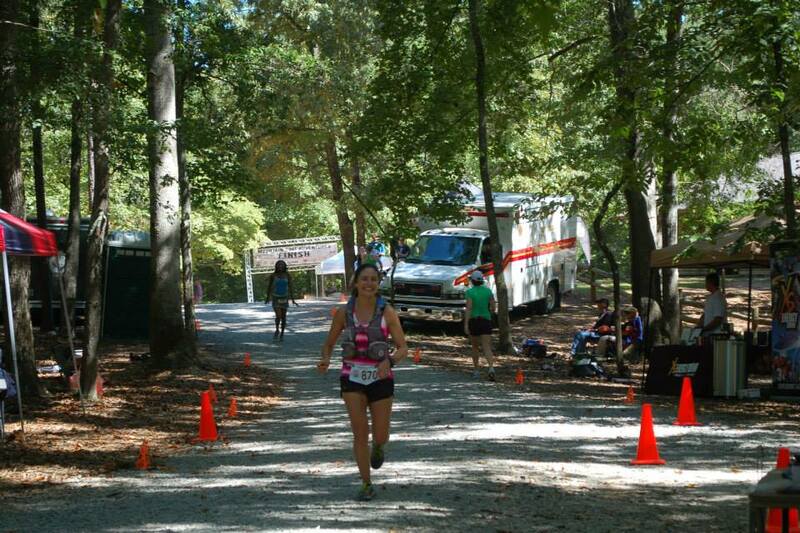 Also despite the fact that we had a “pit stop” set up at the start/finish, I still wore my hydration vest. It had still been pretty hot out, and I wanted to consistently hydrate. I got to the race and set up with Elizabeth. She really had nice dedicated friends and family, which was good, because it also made me appear to have friends and family since I was a squatter at their table. Her friend Kimberly as well as her parents and little niece joined us. Everyone sat up and we waited. 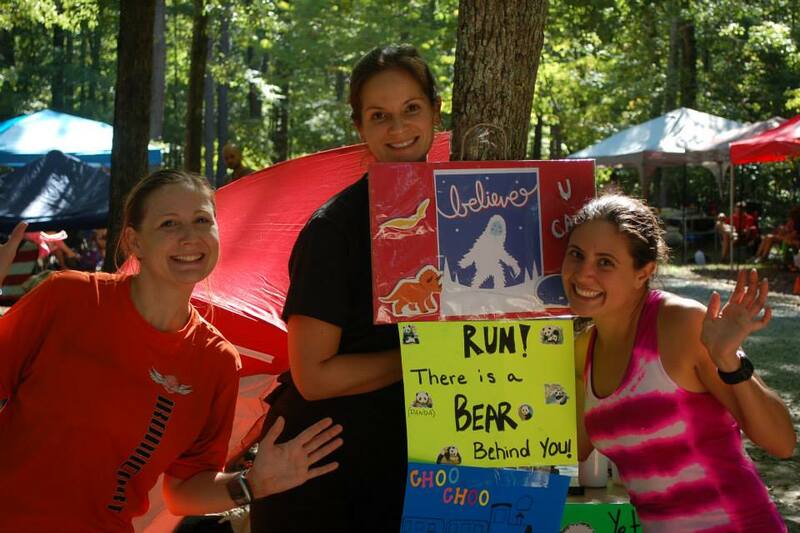 Look at our aid station!!! Kimberly was a great crew chief and the signs were awesome! I ended up seeing trail running buddy Alex as well who also had a large entourage and really fancy set up. I had no idea what I planned on doing with this race – it was either going to be a “just finish” day or a balls to the wall type day, but I hadn’t decided yet. I started off with Alex and his friend who was a 100 miler and we chatted about her races and about the Rock Creek 50 miler and such. I thought I would hang with them for a while, but I was feeling good and although this was a timed race and I should probably pace myself, I decided that I’d go with the usual Liz plan – use it or lose it. So I said my goodbyes and told them I’d see them when they passed me later. And I took off. Well what qualifies as “taking off” for me. There was also a relay going on and there was really no way to tell who was doing what, so I wasn’t sure how well I was or wasn’t doing. After a the first lap someone told me I was the first girl. Hmmm…. Did I want to really try to race this? I stopped at my table briefly and ate some banana and said hello to Elizabeth’s family and set back off. Still felt good. It was getting pretty hot though, and I kept trying to eat and drink as much as I could and take in salt pills. At some point in the second lap I was joined by another girl who I decided was the one beating me and so I raced her. 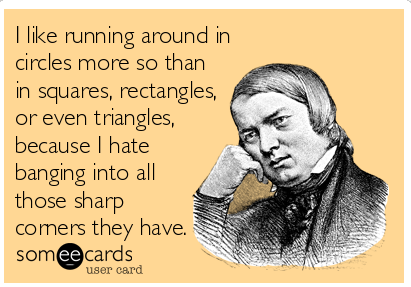 Or at least in my head. I don’t know if she knew I was racing her. We stopped at the one aid station and I heard her tell them she was a broke college student. I decided that it was ok if she beat me because I had to have about 12-15 years on her. Oh that just sounds awful out loud. But on I marched. Lap three I was still feeling pretty good and making good time. I’d managed to run each lap around an hour or slightly less or slightly more. Another girl caught up to us and now I was racing both of them. I didn’t really stop at my aid table except to gulp down bananas since I was still racing the girls in my mind. Potatoes tasted awful for some reason so I stuck with bananas. I tripped on a root at the beginning of lap three and luckily that was my only fall. It was hot and I could feel the salt on my skin. I knew I was dehydrated and just kept chugging and tried to get in what I could. Somewhere on loop 3 or 4 I was really truly racing these other two girls. Like neck and neck. I finally made my move and never saw them again. I would come to find out later that one was running the relay. Grumble. She did thank me for pushing her and I thanked her back because honestly I probably would’ve slacked otherwise. About a halfway in lap 4 I got a horrible horrible leg cramp. I haven’t had a leg cramp like that since my first marathon where I did not fuel properly at all. It hurt like the bejesus. It was insane. I thought, well this is it, I fought a good fight, but I’m going to have to phone it in at this point. And I really thought I had a shot at winning. Blasted. I ate and chugged some extra salt pills and rubbed at it and walked as quick as I could. Some ladies passed and asked if I was ok. I told them I was fine just walking off a cramp and gimped on. Sigh. This was a ridiculously humid summer. Ridiculously. After a few minutes, I told myself, well this is either going to be an uber painful and long walk in or an equally painful but shorter run in. So I started gimping. And I gimped a little faster. And a little faster. Until finally I was running again and at an ok speed. It still hurt like heck, but I got back into stride. By the end of the lap I had run it out or the salt pills had kicked in. Thank goodness. I went out for my fifth lap just feeling the toll of the day. It was super hot and humid by then. I had run fairly fast for me for over four hours. I was crampy. But I was getting this thing done. Yes I was. So I went as fast as I could at this point, mostly to just get it over with. When I got to the top of the hill towards the end, I looked at the little boy who sat there each lap and told him, “I have never been so happy to see you.” He seemed to like that. I barreled down the hill and into the finish area. 5 laps at 5:06. They taunted me over the loud speaker – aren’t you going to go out for a sixth lap??? No way. Not at this point. I’m done. 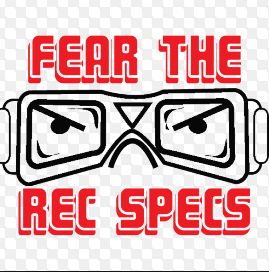 A few minutes after I came in a girl wearing rec specs (yes rec specs like we wore in gym class in the 90s) finished and went out for another lap. I was kind of nervous she would beat me…but we saw her turn around and come back after like 20 minutes on the course. I went to our table and found that Elizabeth had decided she’d just do four laps as the heat and humidity had also gotten to her. Me and Kimberly walked to the finish area and waited for her. She put in an awesome race on a tough day in tough conditions. 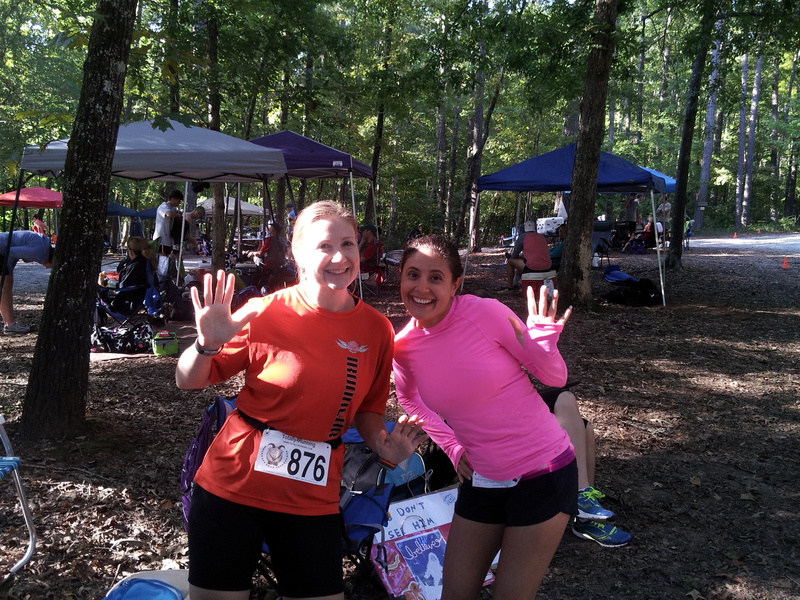 Her first day out as an ultra runner or endurance runner or whatever you want to call it was a smashing success. 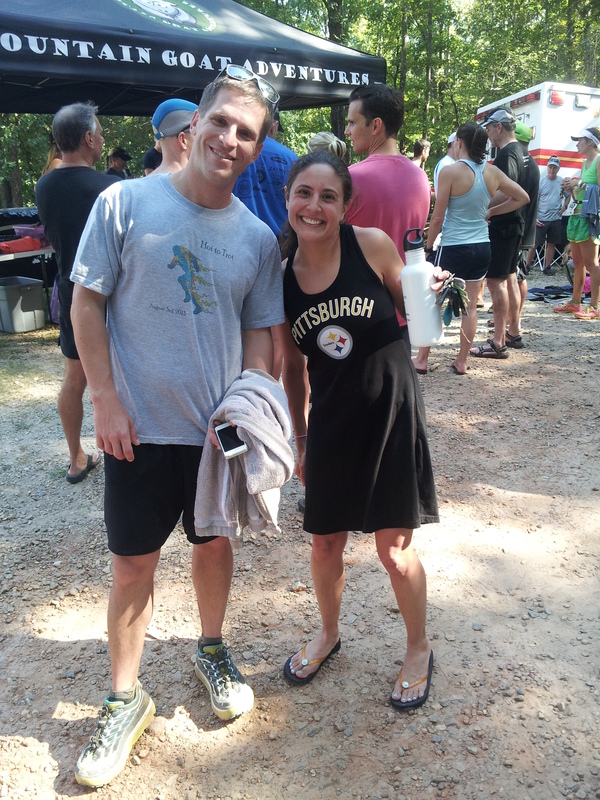 This was only her second trail race! Madness. 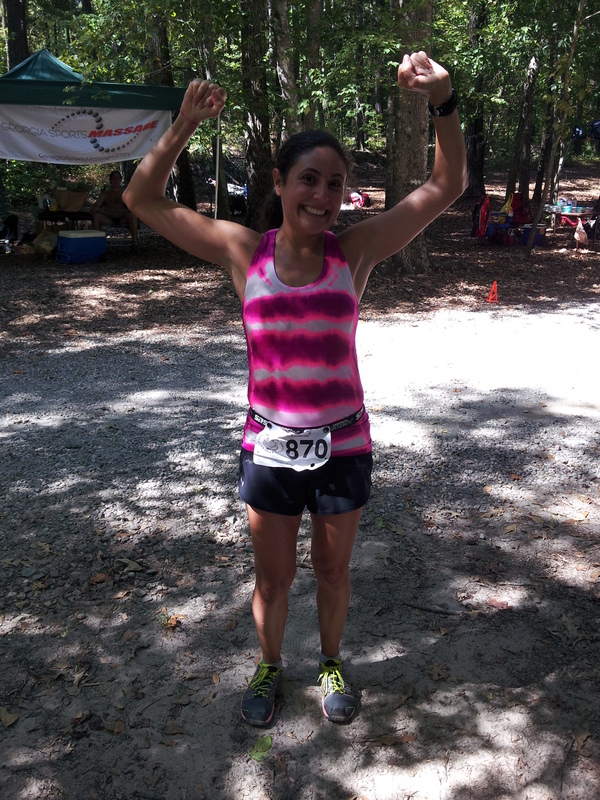 She would go on to finish her first 50k just a few weeks later and rocked it. Yay! After more milling about I changed and looked at these iPads they had with the results (how neat!). It appeared that I had won the women’s and came in 2nd over all with only one dude beating me! I didn’t want to get too excited until it was official. As I was milling about I met some nice ladies who were Swim Bike Mom fans and knew I was the Goat. That was fun and exciting. Although I’m not a good blogger so I forgot to get a picture. The awards came and I did win overall female. Yay! I was pretty pumped. 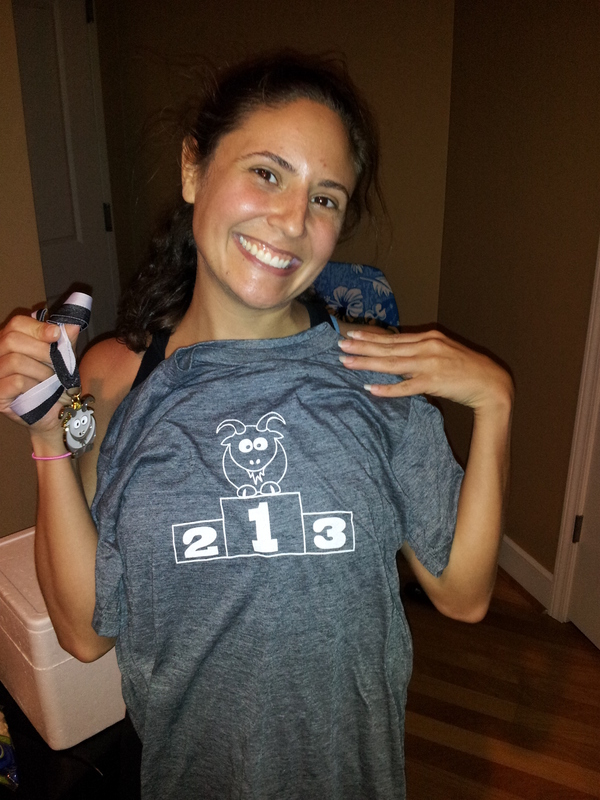 They give you this cool podium shirt showing a little Goat in 1st place to wear! They gave me a small and then I debated about size eventually trading it in for a bigger one which worked out much better. I headed home starving and at according to my detox rules despite just having run nearly 30 miles. Beans, rice and sweet potatoes and greens plain. Sigh. I did eat a ton of it though. 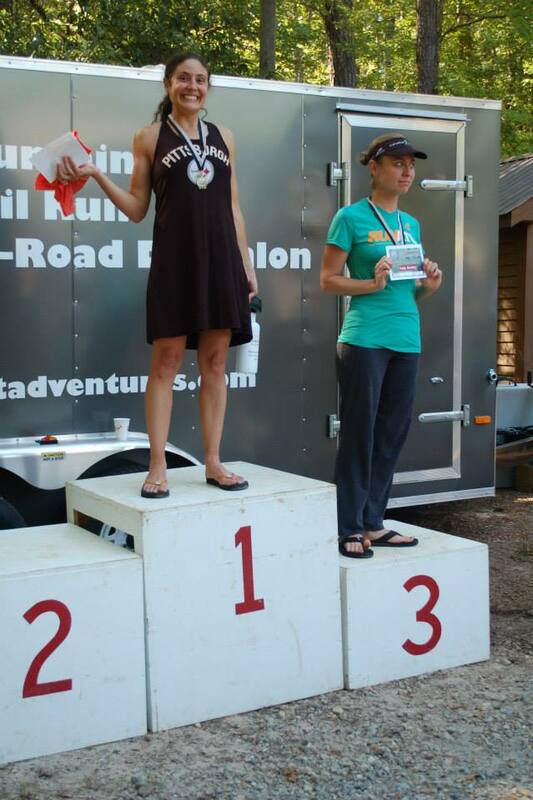 When the results were finally posted I did confirm that I was first female and second overall – only one dude beat me! How sad for the dudes out there that day. But how cool for me! Official time was 5:06 for 5 laps. The laps were supposedly about 5.82 miles long, but there really was no consensus on it. So not sure on distance, but I like to think close to 30 miles. So that’s my story and I’m sticking to it. 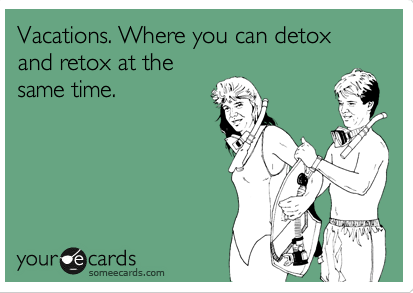 Hopefully I survive the detox! This entry was posted in Race Report, Running and tagged crazy, race report, racing, running, trail running, Ultramarathon by UrbanMountainGoat. Bookmark the permalink.